Spread between the vast Atlantic and the towering Tibataje Cliff is El Golfo. Tucked by its coast are natural pools braving the blows of harsh waves. 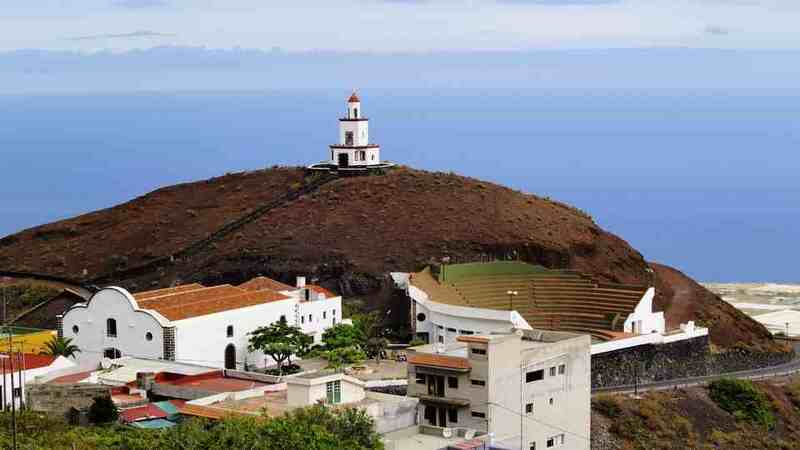 In its expanse are modest yet charming villages of traditional Canarian abodes. 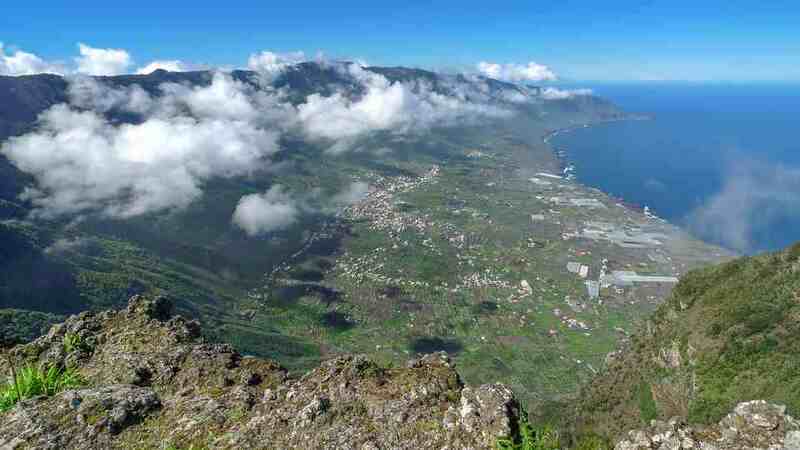 For holidaymakers who want to slow down time and stray from the crowd, this valley in El Hierro is a splendid choice. 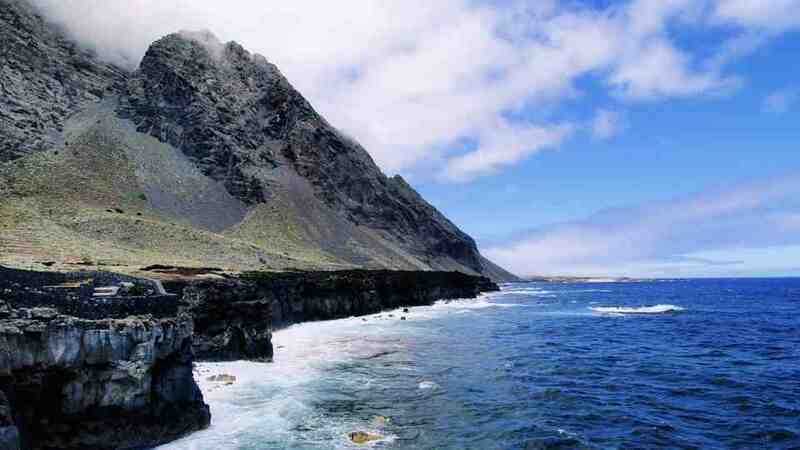 Experts claim that the northern part of the island went through a series of collapse about 15,000 years ago. This depression eventually formed the El Golfo. Fast-forward to a couple of centuries ago, it became an important agricultural center for the island. Locals drilled wells, some of which still exist today, to water the coastal farms. El Golfo makes up a massive part of La Frontera. In fact, most of the municipality’s attractions are within its breadth. Holidaymakers who love being around immaculate natural scenery will especially appreciate its charms. The church bearing the name of the patron saint of La Frontera, Candelaria, is a must-visit when in the area. Standing on a hill in Joapira, the baroque beauty is a site surrounded by sights. Appreciate its elegant yet modest architecture and do take a moment to savor the encompassing views of the mountains and the sea. It’s not every day that one gets to see a reddish ochre beach. So, when sauntering around El Golfo, do drop-by the unique-looking El Verodal. Like most of El Hierro’s coast, the magnetizing sandy shore is the epitome of tranquility. Please note, though, to bathe here with caution as the current is quite strong. The rugged shoreline of El Golfo, although often pounded by harsh waves, has natural seawater pools. These basins, located in different areas along the coastline, are bathing-friendly. What’s more, they offer picturesque views as they are somewhat like the dry land’s balcony to the expansive sea. Piscina Natural La Maceta has two huge pools and one small one. There’s also a barbecue area, a spacious concrete deck for sun-bathing, and a bar-restaurant named Sunset La Maceta. From the edge of the pool, vacationers are free to admire Roques de Salmor. The vacant cafeteria located above Charco Los Sargos may seem like an unwelcoming sight. However, it is in no way a reflection of the beauty that awaits past the downward lava cobbled path. Be careful when climbing down as the steps are uneven. The fencing, though, is strong and sturdy. Apart from the steel rail, the two pools here are all natural and unmanufactured. 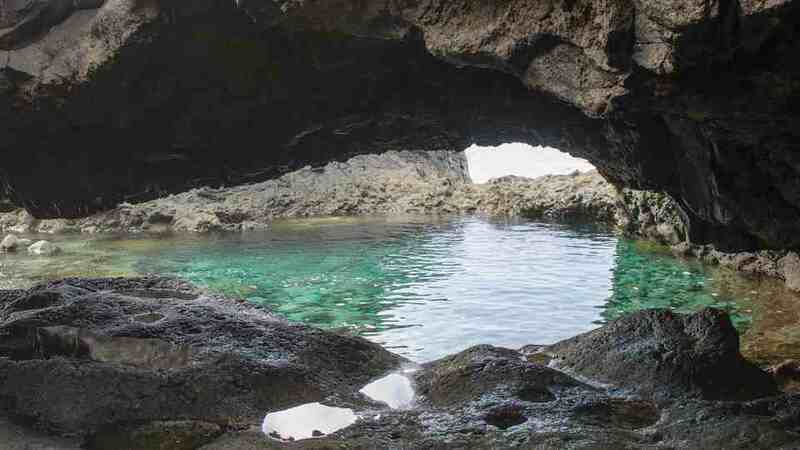 Both are open to the sea and extend into fascinating lava caves. 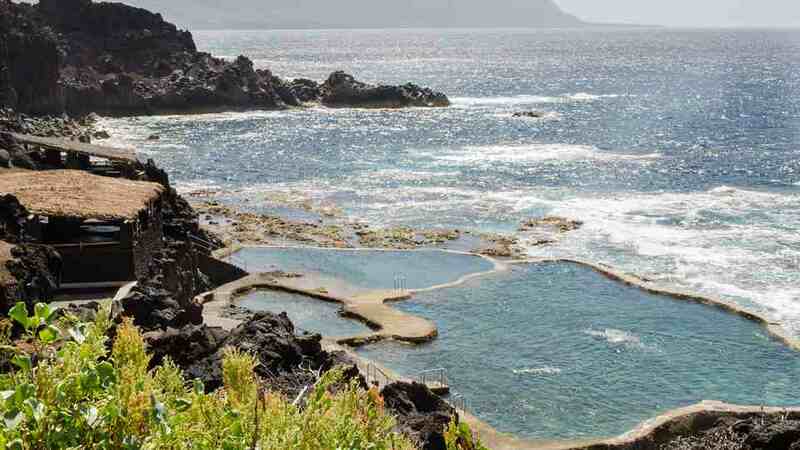 If visitors don’t have the luxury of time, like those who are only in El Hierro for a day trip, Charco Azul should still be on their must-visit list as it is indeed the most spectacular of all natural pools in El Golfo. A narrow road and a path of over 100 steps (and a couple of viewpoints) lead to the natural delight. Once there, they can happily float in its turquoise pools and enjoy the sudden sprays of seawater from the crashing waves. 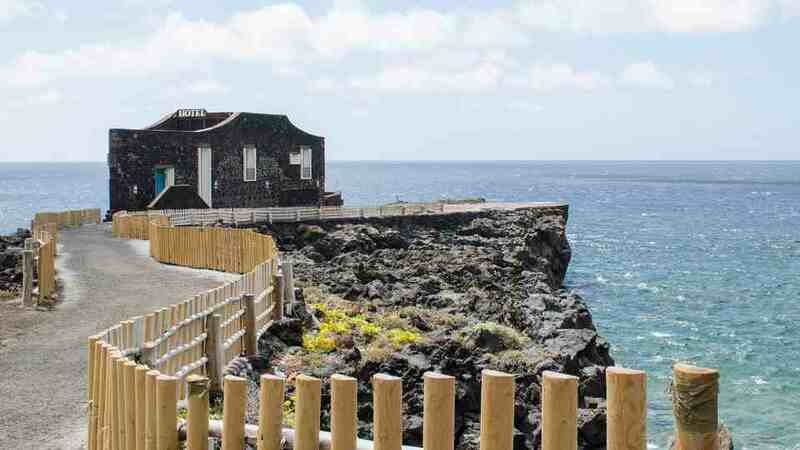 Pozo de la Salud or Well of Health is one of El Hierro’s top tourist spots. Its very existence tells so much of the ups and downs the island experienced throughout the centuries. Aside from that, the panoramas here are phenomenal. It stands on a rugged cliff that overlooks the boundless Atlantic. And, behind it, a majestic mountain stands proud. El Golfo is home to several settlements. Frontera and Sabinosa are the largest, while Los Llanillos, Merese, Toscas, and Tigaday are of smaller size and population. A favorite amongst hikers, Sabinosa is famous for its groves of Junipers, most notably the melancholic Sabina de El Hierro. Los Llanillos and Las Puntas, on the other hand, are just the place for leisure walks and unwinding. From Valverde, tourists must ride bus number 03 to La Frontera (as El Golfo is in this municipality). On weekdays, the bus departs at 08:00, 10:30, 13:10, 15:30, 18:00, and 21:30. On weekends and holidays, the bus leaves at 08:00, 10:30, 13:30, 18:30, and 21:30. To go around the different towns and attractions within La Frontera and El Golfo, take bus line 04 and 12. Most vacationers opt to rent a car and drive around as it is most convenient. They simply need to follow HI-5 which connects Valverde to El Golfo. Because El Golfo has such magnificent natural surroundings, accommodations within the area need not try hard to impress holidaymakers. Glorious sights are at every turn, waiting outside every window and door. Still, they try their very best to have that X-factor or selling point that sets them apart. CasArte is perfect for artists and free thinkers. Its inside is similar to a gallery as it’s adorned with fascinating art pieces. Outside, a fantastic garden awaits were they can freely relax and see pure nature. Here, even regular vacationers get inspired to unleash their creativity. Please note, though, that there are months when it’s hard to reserve as the casa also offers residency programs. With only four rooms, Punta Grande Hotel is the smallest hotel in the world. Locals call it “the hotel on a rock” and, true to its moniker, it does stand on top of a natural breakwater. Because of its peculiar position, it gets to offer pastimes that other hotels can’t. Guests can watch raging sea waves crash just 10 feet below the hotel window. They can also fish from their rooms on days when waters are calm. Guests have a panorama to applaud wherever they are in Hotel Balneario Pozo de la Salud. Right in front of the building is a splendid mountain that towers above everything else. At the back, the magnificent Atlantic invites sightseers to witness its vastness. If all those are not enough to make vacationers feel better, they can also try the clinical, aesthetic and relaxation treatments offered in the hotel’s spa. Most of the restaurants in El Golfo whip up traditional Canarian cuisine. Thus, vacationers get to know more about the locals and the archipelago with every meal. What’s more, these dishes have a subtle hint of Spanish and Mediterranean flavors which make them even tastier. Although mainly a coffee shop, La Casa Abajo also has an assortment of other items for sale. Here, tourists can enjoy their crowd-pleaser Pastel de chocolate with a cup of coffee while also shopping for ceramics and sports apparels. They can have a bottle of cerveza or a glass of local wine while checking out the different wall displays. Meat lovers should march to Asador Artero when touring El Golfo. Their steaks are enormous and they offer plenty of other delightful plates such as garlic prawns, fish lenguado, roasted suckling pig, and grilled cheese. For dessert, try their pudding and cheesecake. Vegans shouldn’t shy away from this food establishment either as they have herbivorous dishes too. Feel like rushing a meal and hitting the road fast to see as many spots as possible? When dining in Garanones, holidaymakers need not haste at all. Right in front of the humble restaurant is the wondrous coastal landscape of El Golfo and the enormous Atlantic, so sightseeing continues even while guiltlessly savoring delicious dishes. Seafood is most definitely their specialty, and their best-sellers include chipirones, moray eel, and parrot fish. Tibataje Cliff and El Golfo were once one. Thousands of years ago, through a series of erosion, they became separate landforms. The latter became a way for that side of the island to touch the sea. 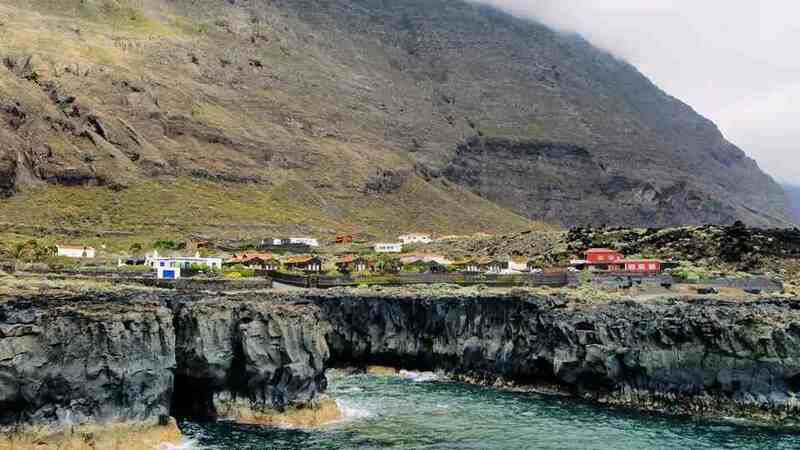 Its coastal lava formations, in time, turned into natural pools so people can enjoy the harsh Atlantic. Within the depression are serene towns where both locals and tourists breathe easy. For those in search of a place where they can escape to be close to nature and recharge, El Golfo is just the place.